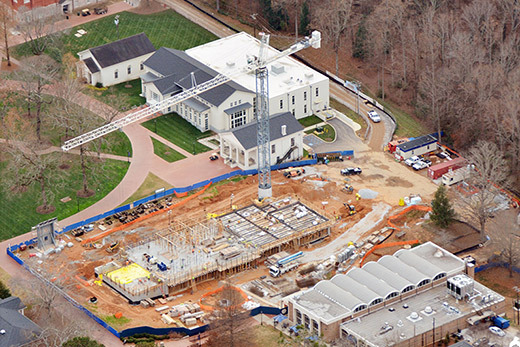 At 57,400 square feet, the Oxford College Science Building is on schedule to open for classes in spring 2016. Because every Oxford student is required to take at least one laboratory course, the new science building will influence the education of all students at Oxford. Because Oxford faculty members teach their own laboratory classes, the science building will further the Oxford ideal of teaching and knowing each student as an individual learner. Ground was broken in May 2014, and recent milestones include foundation work, wall framing of several floors, pouring of the elevated deck on the third floor, and the completion of the mock-up wall for exterior finishes. The building is expected to achieve LEED Silver certification for energy efficiency.